I like books. I can rarely walk past a charity or second hand book shop without having a little nose around. My affection for literature is not just for old books, I love the smell of new ones. As a result of my fondness, and subsequent collection of books, it was about time I sorted a few out in order to prevent some sort of hardback avalanche occurring. So that I didn’t get bored I thought it was a good idea to intersperse the organising with some biscuit making. I had bought some spelt flour a while ago to make some soda bread and there was a recipe on the back for these biscuits. They sounded ridiculously quick and simple and I thought it would be rude not to give them a try. You can find a very similar recipe on the Doves Farm site here. These are some of the easiest biscuits I have ever made; mix everything together, put on a baking tray and bake for only 8-12 minutes. In amongst all the book sorting, biscuit mixing and desperation in trying to remember to remove all dough from my hands before it ended up on my books I have a few tips to pass on. Firstly, if you weigh the oil out first and then weigh the honey on top of the oil it will all slide out together and you won’t be stuck scraping honey out of your measuring bowl. Secondly these biscuits grow quite like no other; at least doubling in size so leave plenty of room. Lastly they need at least 12 minutes baking, mine took about 15 minutes in total but that may have been because they were large. It was nice to have a biscuit where all the sweetness came from the honey. I thought the subtle local honey I used may get overshadowed but it didn’t. I think next time I would add a little more cinnamon. The biscuits had a lovely crumbly crunch and beautiful golden colour. Perfectly nice on their own but I thought they needed a bit of sprucing up. Also I felt like I had exercised my biceps enough to justify filling the biscuits with vanilla buttercream. While I waited for the biscuits to cool so I could slather them in calories I consulted my plethora of books to find one to flick through. I spent the afternoon looking through books I’d forgotten I had with a few biscuits and a nice cup of tea. Lovely jubbly. If I’ve learnt anything it’s that I need more books so that I have an excuse to do this again. What a great combination!! They look like such perfect treats! Giant biscuits with honey sound inspiring. I like your tips; it is terribly annoying to scrap honey out! Regarding the oven temperature, I have learnt that every oven is different. My oven becomes very hot so I often reduce the temperature. You have just inspired me to try baking with spelt flour. Thank you! Yum, just my kind of recipe miss! Wow, these look fantastic 🙂 What a great flavor combination! 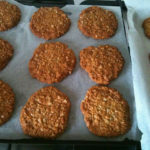 The easiest recipes at times brings out wonderful outcome and for sure I can see from the biscuits you have made. The filling inside makes the biscuits fabulous and fantastic. These are delicious. I love spelt and it is so good for you too. Bookmarking this, I think I will make them for my children. It is nice to give them an healthy treat. I like books too 😀 … and numbers :D… AND biscuits! Speaking of, I just used spelt for the first time in some strawberry shortbread. What a brilliant idea to fill these with vanilla buttercream. I have the same problem with books–I’ve started trying to weed through them, but for every one I get rid of, I find another I must have. ah, you’ve just described what sounds like a perfect day to me. Reading, sorting through a great beautiful selection of books, and then taking breaks in the kitchen. Been swamped with work lately, but can’t wait for the holidays so I can start enjoying days like this too! 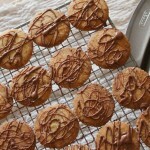 these biscuits look great, lovely combination of ingredients! i definitely need to try spelt flour, and now i’m wondering if i should think about getting a kitchen scale to weigh ingredients. 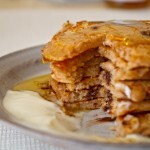 I’ve got some spelt flour in the cupboard and I love cinnamon and honey-so must make these-thank you! I can’t put my finger on what these biscuits remind me of. Something home made as a child no doubt but they look so tantalising. Just out of interest, how does spelt flour taste? I’ve been meaning to buy some and create a spelt loaf but still not got round to it yet. These look perfectly crunchy! I love it! Have a wonderful weekend!